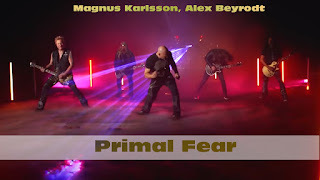 Former Gamma Ray vocalist Ralf Scheepers and bassist/vocalist Mat Sinner, two of the most respected German metal musicians, founded Primal Fear in 1997 and 21 years later, show no signs of slowing down. With 11 studio albums released, Primal Fear have become one of the most beloved and respected heavy metal bands around the globe, a true metal institution. Their last two studio albums “Delivering The Black” and “Rulebreaker” saw them climbing the charts and receiving even more critical praise than before. Truly, especially in recent years, the band has continued to raise the bar in terms of quality and musicianship with their release, constantly pushing themselves to find new ways to best themselves. And with the release of their new albu, “Apocalypse”, Primal Fear has once again raised the bar in heavy metal to towering heights! Former Gamma Ray vocalist Ralf Scheepers and bassist/vocalist Mat Sinner, two of the most respected German metal musicians, founded Primal Fear in 1997 and 21 years later, show no signs of slowing down. With 11 studio albums released, Primal Fear have become one of the most beloved and respected heavy metal bands around the globe, a true metal institution. Their last two studio albums “Delivering The Black” and “Rulebreaker” saw them climbing the charts and receiving even more critical praise than before. Truly, especially in recent years, the band has continued to raise the bar in terms of quality and musicianship with their release, constantly pushing themselves to find new ways to best themselves. And with the release of their new albu, “Apocalypse”, Primal Fear has once again raised the bar in heavy metal to towering heights!